“Sri Rama Jaya Rama” Mantra was chanted during Deepa Pooja, Shivalinga Pooja and daily by our Balwadi school children, cultural class students and during monthly meetings by our Balwadi teachers and Social Workers. Every month nearly 8, 52,122 times mantras were chanted in 84 localities. Through 74 Balwadis, 1,795 rural Children were nurtured. In all the Balwadis, Malt along with hygienically prepared highly nutritive lunch with vegetables was served during the day. And in the evening vitamin-rich cereals were provided to the children. In our Medicare Programme, 1818 patients were examined and treated for various common ailments, through 14 Rural Medical Centers in Kanyakumari, Nellai and Thoothukudi districts. In 173 Samskara Vargas, 6259 students participated. The students were taught about the values of Indian Culture, through games, lectures & lessons. The feelings of oneness were strengthened among participants, through patriotic songs and games. Under Adopt a Grannie Programme, 26 destitute and old people were provided with monthly solatiums, in the form of rice, dhal, oil, etc., for their livelihood and 115 persons provided rice only, in Southern four districts of Tamilnadu. Monthly Deepa poojas were organized in 216 village temples in five districts of Southern Tamilnadu, in which 9006 ladies participated and offered prayers for the welfare of self, family and the society. Under Amrita Surabhi Scheme, our Kendra workers collected 550 Kgs of rice from five districts. Vivekavani Subscriptions for 133 three years one and 5 Patron were collected. 4 tailoring units are functioning well in Nellai & Kanyakumari districts with the total attendance of 81. Shivalinga Poojas were conducted at 03 places in Kanyakumari District and 166 members participated. Durga Pooja was conducted at 03 places, in Kanyakumari District in which 179 devotees participated. Eye camps were conducted at 3 places, in Kanyakumari, Nellai and Thoothukudi districts in which 699 were treated for their eye ailments and 111 unter went cataract operation. 38 persons were given eye medicines and 31 persons were given spectacles. 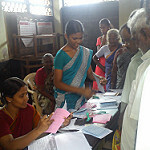 Kendra Varga has been conducted at in Aruppukottai where 10 persons attended. Parents meeting was conducted at 2 places in Kanyakumari district and 44 persons participated. On 4th July 2016 Swami Vivekanandar Maha samathi day was observed with Anna Pooja and Social Workers Cultural Programme at Kanyakumari. More than 1000 persons came from southern five districts participated in this programme. Education Aid distributed 16 needy students worth of Rs.88500/- sponsered by Sriganesh Nantha Gopal,- Coimbatore, Maria Pia Machi, Siva Priya Ashramam- Curtralam. More than 3000 persons were served with noon prasatham including Vivekananda Kendra Vidhyalaya Kanyakumari, Vallioor students and teachers 1700. Social workers refresher camp was held between 05.07.2016 to 08.07.2016 at Kanyakumari and 28 workers participated.All Social Workers visited one day to Koodankulam Nuclear Project - Koodankulam.On 8th July Vahana pooja was performed. Balwadi teacher refresher camp was held from 30.06.2016 to 03.07.2016.
attended the camp. During the camp all the teachers were well trained. places and 3950 participated in the function. 600 persons participated and 500 kgs rice collected. her. The boys maturity touched my heart. As I was suffering from some poisonous infection I went to a shop to buy medicinal plant for it. There I met a Headmaster and his wife working as a teacher in V.K.Puram. As they were known to me they talked intimately. The shopkeeper enquired me about my job and advised me to take care of the health. “Doing service is appreciable. To continue best service good health is essential” saying this he treated me kindly. I am proud of being a Kendra service worker. This incident happened while conducting Midalangadu cultural competitions. One of the special invitees for the valedictory function asked us to tell a story to inspire the participants. At once Kasthuri teacher narrated a story in simple language so as to make all the children understand. The person who asked for the story told us that he didn’t even know that story and appreciated her. He also commented that the trainees of Vivekananda Kendra were talented and service – minded. That was their special quality. We all felt happy and proud of hearing such appreciation.